Going into the Night of Champions pay per view I had no idea if Seth Rollins was going to retain his WWE World Heavyweight title against Sting. In my opinion, not knowing is a good thing. Yes, Sting is 56 and-a-half years old and had he won the gold, he would have become the company's oldest heavyweight champ ever. I would have been fine with that on a very short term basis. I'm glad it didn't go that way and Rollins is still the champion. The bigger issue now is the injury Sting suffered during the course of this championship match. 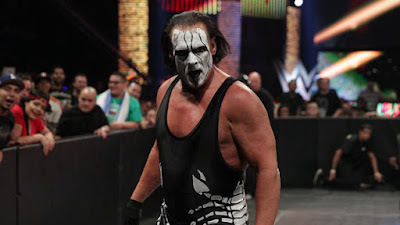 I believe I'm correct in saying the Night of Champions event was just Sting's fourth match in WWE. He lost to Triple H at Wrestlemania 31, beat The Big Show by disqualification on Raw and later that same night teamed with John Cena to beat Show and Rollins in a tag team match. So he's .500 in WWE and after getting hurt against Rollins, he may be done. There is speculation the injury to Sting's neck could be career threatening. I take online "reports" with a grain of salt, but at the same time I know Sting likely didn't have that many matches left in him anyway. My hope is that he's not done just yet and has a chance to go out his way. I'd love for that to be at Wrestlemania 32, where I intend to be among the 100,000 other members of the WWE Universe at AT&T Stadium in April. It'd be fitting to induct him into the Hall of Fame the night before and have him go out in style although these days most retirement matches end with the retiree putting over the opponent to keep the circle of life going. Sting's tenure in WWE has been short. Like most fans, I wish he would have signed sooner. And like most fans I hope he still has at least a few more matches in him. However Sting has nothing left to prove to any of us, but most fans today weren't even alive during Sting's first run as WCW heavyweight champions 25 years ago. Wow, I'm old... No matter what the future holds for the Icon, I wish him nothing but the best. What's Happening to My Childhood??? 5 Years of Making "Cents"